As it happens I’m not mad about mince pies despite having probably made more mince pies, literally hundreds, than any other baked item, festive or otherwise. The way I have made them palatable is by pimping shop-bought mince meat, adding a fierce amount of tangy cranberries and fresh orange and lemon juice not to mention the extra kick o’ spice. The recipe below is a mere guide, use whatever quantities you prefer. 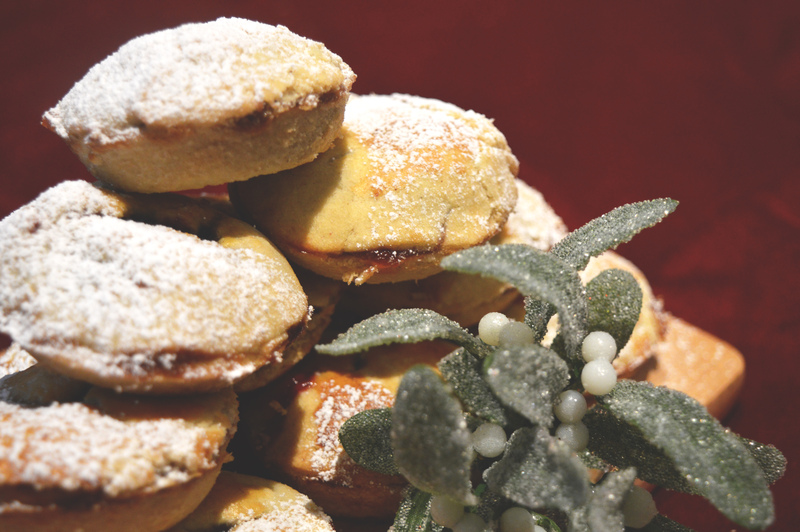 I use the same pastry as always but give it a Christmassy hit of ginger and cinnamon. 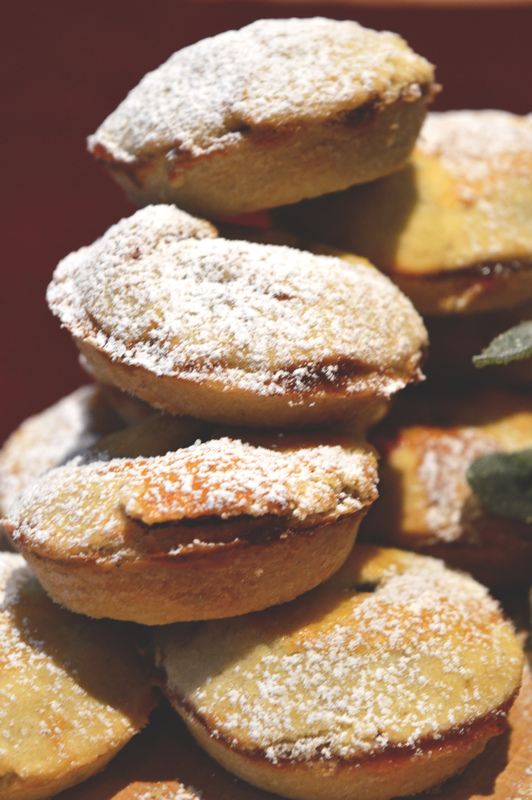 Let there be no mistake, before we go any further, mince pies are fiddly as all hell to make and they do take a while but there really is no comparison between a freshly home-baked mince pie and a clunky, pastry heavy, filling light, donkey of a mince pie from a supermarket. So set aside an hour or two and make them at the kitchen table with a cup of tea and some nice music playing in the background. (The mince meat you make can be stored in a jar in the fridge till the apocalypse). To make the mincemeat, empty the jars of mincemeat into a large mixing bowl – save the jars to store the left over mincemeat. Put the fresh cranberries on a baking tray and pop them in the oven for about 10mins till they start to pop. Meanwhile put all the other ingredients in with the mincemeat. 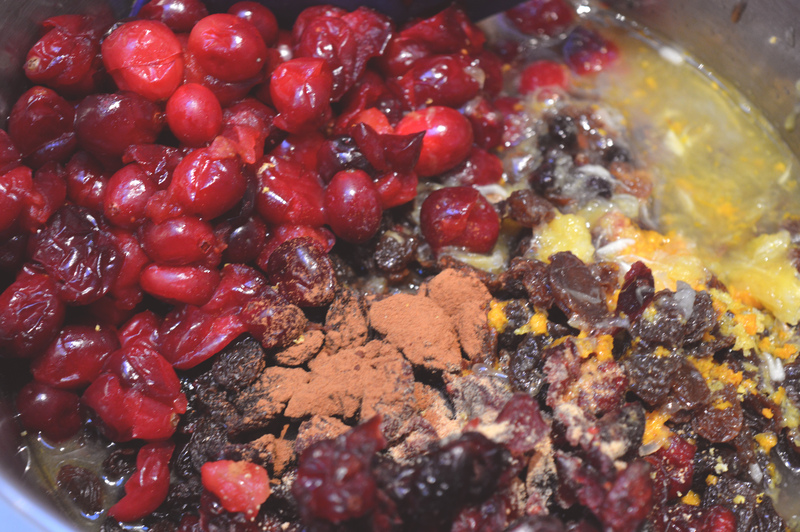 When the fresh cranberries have popped put them into the mincemeat too and mix everything together. The smell is ridiculously festive and makes the fiddliness worthwhile. If you think your mix is too wet add in some more dried fruit and let it sit for half an hour. Also, feel free to add in some alcohol if you fancy. For the full method on how to make pastry click here otherwise blitz all the dry ingredients together in a food processor, till crumby, then add in the wet ingredients and pulse a few times till a ball starts to form then tip it out and squish it together to form a smooth paste. Wrap in parchment or clingfilm and pop into the fridge to chill. Grease some bun trays with butter and flour. The pastry makes about 18 pies, depending on the size. Now let the real messing begin. 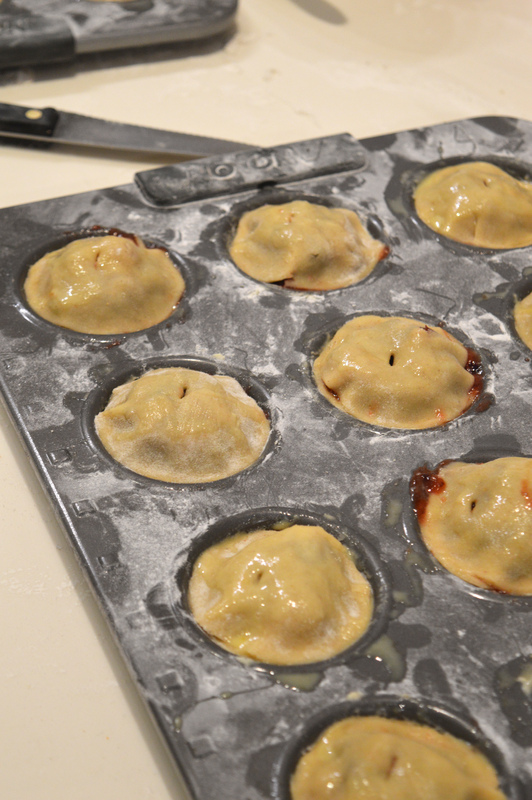 Get your pastry out of the fridge and tear it into two pieces; one a bit bigger than the other. Flour your work surface and begin to roll the bigger piece. Roll it out as thin as you dare, mine was about 3mm. 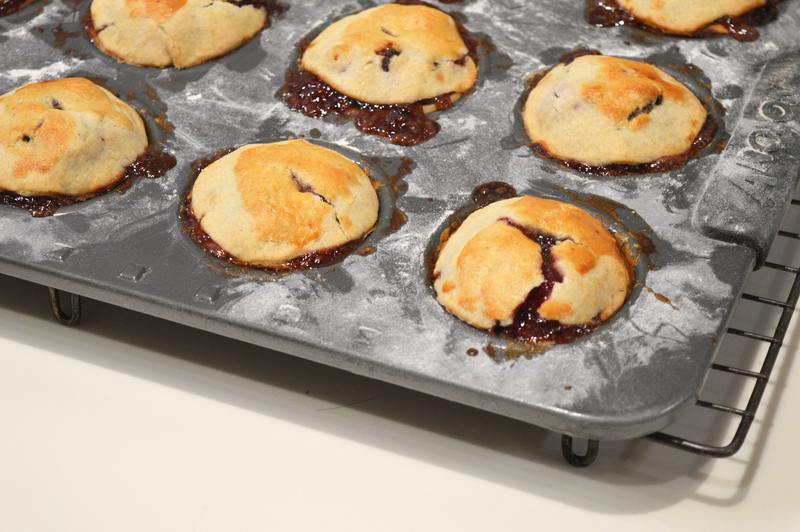 Choose a pastry cutter that is a little bigger than the size of your bun tin holes for your pie bases and then choose a second one, a little smaller, for the lids. Cut out the 18 bases first. Lift them gently onto the bun tray and very gently push them into the tray. Once you’ve filled a tray with pastry bases put it in the fridge while you do the other bits. 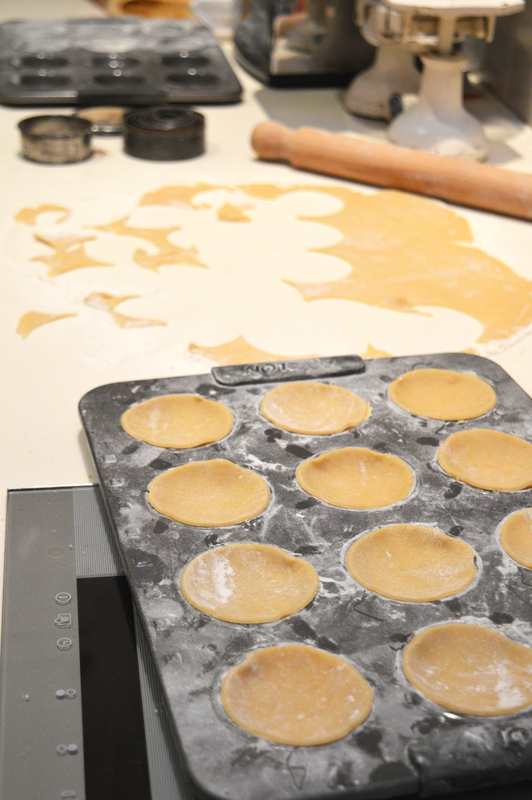 Cut out the 18 lids from the smaller piece of pastry. It’s sometimes helpful to cut a few extra, if you have the pastry, because sometimes the lids can fall apart when you stick them to the pies. Make the egg wash by beating the egg with a dash of milk. 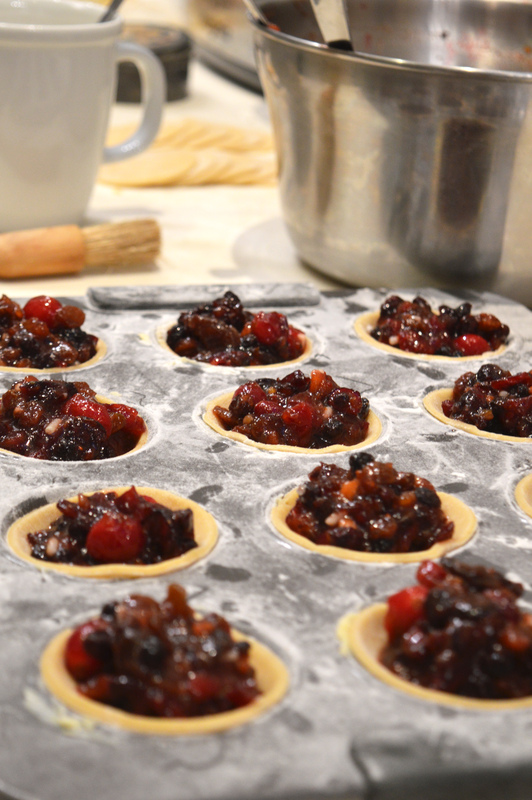 Take the trays out of the fridge and, using two teaspoons, generously fill each case with your mincemeat – being careful not to get any on the tray itself because it’ll turn into tar when baked. Then use a pastry brush to paint egg wash around the rim of each pie. Carefully put a lid on each pie and gently press down around the edges to stick it all together. You can egg wash the top of your pies if your feeling fancy and then stab each one to give the steam somewhere to go. Put the trays into the preheated oven for 20mins in total but turn the trays after 1omins to make sure everything browns evenly. They’re done when they’re beautifully brown. Remove them from the oven and let them cool down entirely in their tins. If you don’t you’ll burn your hands and all the pies will fall apart. When they are cool, loosen them from there constraints with a little knife and dust with icing sugar to show off. Drooooool! These look wonderful. Think I’ll give them a go this weekend. Hi Annie, thank you very much for such kind words. Best of luck with the pies!